• All Department requests for Penn employment visa-sponsorship and immigration documents should go to Kathryn Fogle, Immigration and Employment Compliance Manager, 219 Towne Bldg, 215-746-7539. 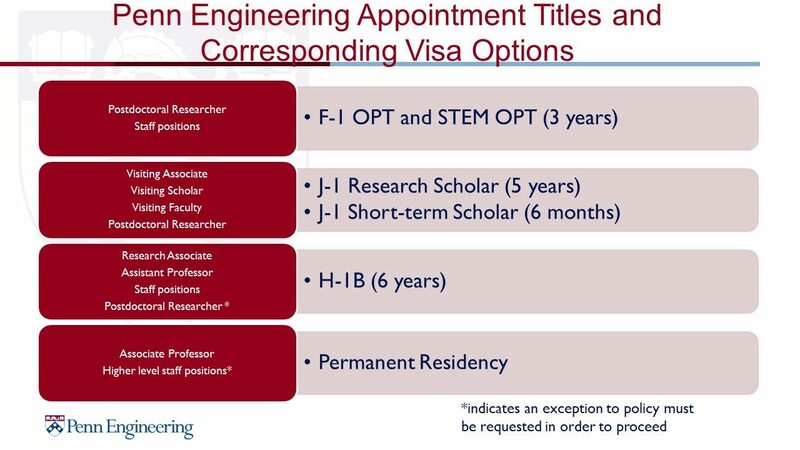 • Forms I-983 for Postdoctoral Researchers and employees applying for STEM OPT must be completed by the F-1 visa holder and his/her supervisor and submitted to Kathryn Fogle for review and signature. • All newly hired foreign nationals should meet with Kathryn Fogle at the beginning of their employment as SEAS. • All new foreign national tenure-track Faculty members should contact Kathryn Fogle to review the permanent residency process. • Departments should notify Kathryn Fogle if any foreign national leaves his/her position earlier than planned so that the appropriate immigration reporting can be completed in a timely fashion.